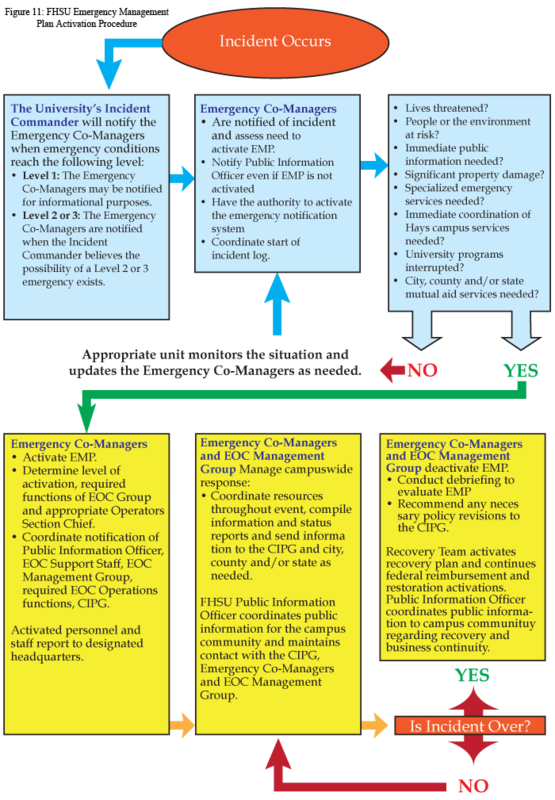 During the response phase of a level 2 or level 3 emergency, the university will activate the EMP to assess, contain, resolve and recover from an emergency. Responses to emergencies vary greatly depending upon the severity, magnitude, duration and intensity of the event. The response will be managed by the university IMT and will use the NIMS and ICS systems. 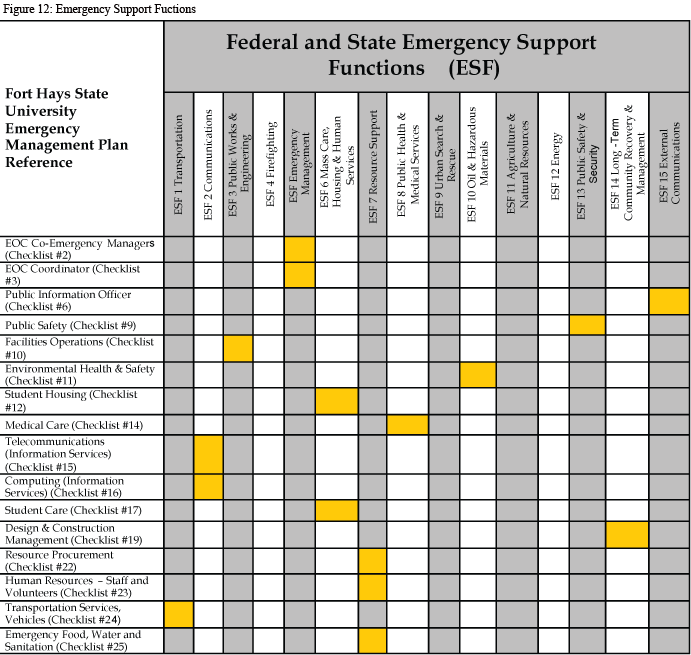 Emergency Support Function (ESF) Annexes identify the primary and support functions for each ESF.  The ESF Annex describes tasks assigned to members of the IMT and other parties, including nongovernmental partners. Support Annexes describe the framework through which FHSU responds to emergencies. The actions described in the Support Annexes apply to nearly every type of emergency. Each Support Annex defines the specific roles of the university IMT members throughout an event. Hazard-Specific Annexes describe strategies for managing missions for a specific hazard as identified by CIPG in the risk assessment process. These annexes explain the procedures that are hazard-specific. Appendices provide relevant information not already addressed in the Basic Plan. Typically, this includes common information such as a list of terms and definitions, guidelines for EOP revision, or an EOP exercise program. It may also include forms used for managing emergencies. Physical and Structural Recovery. The IMT will create a Damage Assessment Team. This team will consist of campus personnel in areas such as safety and security, facility management, risk management, budget and planning, transportation, food service, and computing and technology, as well as community partners. The Damage Assessment Team will evaluate physical and structural damage; assess the availability of housing, transportation and food services; and determine the degree to which equipment is functional. The major goal of the assessment is to determine the extent of the effects of the incident on campus and community assets and new vulnerabilities created by the emergency. Data from the assessment will facilitate decision making about repairs and time lines to resume normal operations. Restoration of the Academic Learning Environment. Restoring the learning environment may involve housing students and conducting classes in off site locations, conducting online learning, and implementing temporary procedures for assignments, grading, attendance, and tuition and housing payments. It is important to communicate the decisions and next steps to the media, faculty, staff, students and families in an expedient fashion. Establishing such communication platforms as a website or call center to manage inquiries will facilitate the communication process. Psychological and Emotional Recovery. It is critical to identify the mental health resources in collaboration with partners to promote psychological and emotional recovery. Through this collaboration, students, faculty and staff will have the opportunity to receive short- and long-term mental health services on and off campus or obtain referrals for more long- term counseling. As part of the preparedness phase, campus mental health personnel should establish a prescreening and approval process for mental health personnel who could help during and after an emergency. In addition to providing mental health services for students, it is important to offer such services to employees and volunteers who may be responsible for the response and recovery effort.